happiest of mondays to you. it's a beautiful fall-like day in dc and hopefully in your neck of the woods, too. 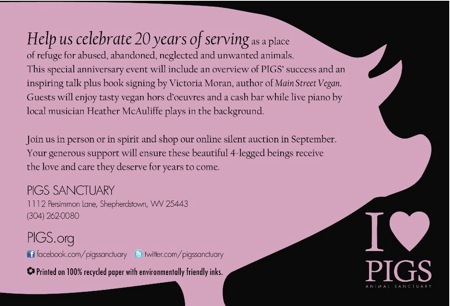 i'm writing to share this upcoming event i'm hosting in dc next wednesday, september 19. as you know, i'm in love with these 4-legged furry beings and am excited to celebrate pigs animal sanctuary's 20 years serving as a refuge for unwanted and abandoned animals. the cocktail event includes piano by the talented heather mcauliffe, a sweet locally-made gift for the first 50 guests, tasty vegan hors d'oeuvres, and an inspiring talk plus book signing by the lovely best-selling author victoria moran. 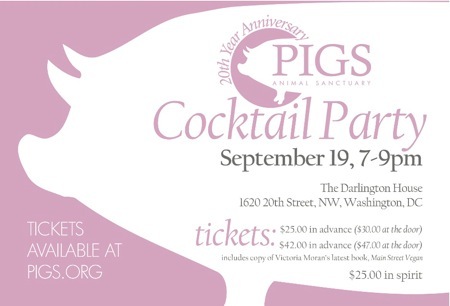 oh, and did i mention we'll have pigtinis for sale - yummy pink libations! to support the efforts of the sanctuary, please purchase an "in spirit" on "in person" ticket and browse our online silent auction filled with amazing goodies from generous donors including teaism, vaute couture, tranquil space, TranquiliT, aveda, farm sanctuary, and more! oh, and a mentoring session with moi is included, too.